Expand your horizons with the DX-format ultra-wide-angle AF-P DX NIKKOR 10-20mm f/4.5-5.6G VR. Covering a focal length range of 10-20mm*1, the AF-P DX NIKKOR 10-20mm f/4.5-5.6G VR will surprise and delight you with its ability to capture sweeping landscapes and stunning architecture. Created with a compact and portable frame, this lens comes with a suite of innovative NIKKOR technologies, such as the Vibration Reduction system and a quieter autofocus drive for an enhanced performance. Experience true optical brilliance shot after shot with the light and maneuverable AF-P DX NIKKOR 10-20mm f/4.5-5.6G VR. From vast landscapes, to architecture and interiors, the AF-P DX NIKKOR 10-20mm f/4.5-5.6G VR will give you the flexibility to capture the scenes you desire. With a focal length range of 10-20mm*1, experience what its like to dramatically increase your field of view to capture a wider expanse. 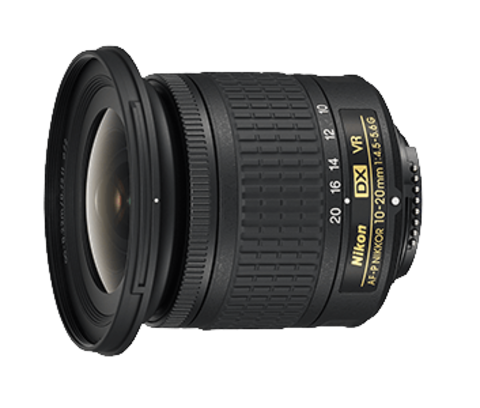 Photograph close-ups of your subjects in extraordinary detail, thanks to the AF-P DX NIKKOR 10-20mm f/4.5-5.6G VRs maximum reproduction ratio of 0.17x, and a minimum focus distance of approximately 0.22m. 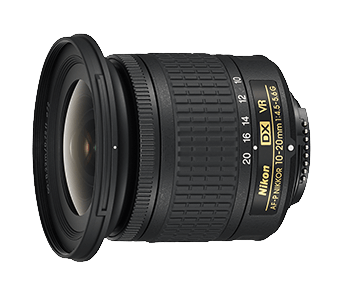 To ensure each and every shot is clear and crisp, the AF-P DX NIKKOR 10-20mm f/4.5-5.6G VR contains three aspherical lens elements that effectively correct distortions and other types of aberrations  even at the periphery of your frame. Achieve sharper and steadier shots on the move with the AF-P DX NIKKOR 10-20mm f/4.5-5.6G VRs built-in Vibration Reduction system. While providing an effect equivalent to a shutter speed of 3.5 stops*2, Vibration Reduction will help you to easily capture smooth and seamless footage, time after time. Featuring a stepping motor that reduces noise from within the autofocus drive, the AF-P DX NIKKOR 10-20mm f/4.5-5.6G VR is perfect for photographing subjects in their natural environment, without any disturbances. An improved focus ring also allows for smoother manual focus control, giving you an easy and enjoyable experience. Compact and lightweight, the AF-P DX NIKKOR 10-20mm f/4.5-5.6G VR is perfect for your next adventure. 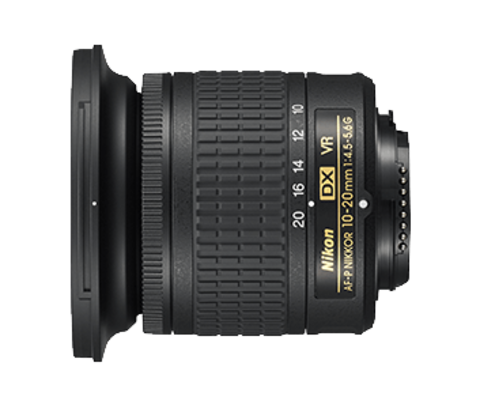 Weighing only approximately 230g, the AF-P DX NIKKOR 10-20mm f/4.5-5.6G VR is designed to be portable without compromising on optical performance or image quality. Angle of view is equivalent to that of a 15-30 mm lens in FX/35mm format.